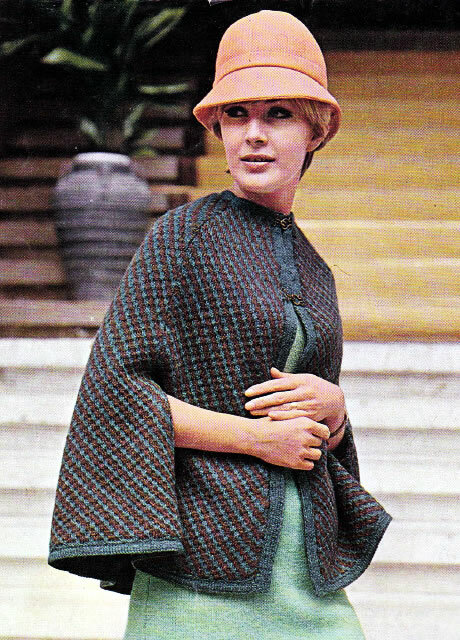 This is an earlier version of a knitted cape and includes a (knitted) lining - so potentially nice and warm. I thought it was a good option to publish alongside the seventies version. The lining is knitted but if you did not want to commit to all that knitting I think it might be simple enough to cut out the shapes in fabric to create the lining - as long as you choose a material that's not too stiff or thick, although the cape as shown seems to be styled with quite a firm structure. 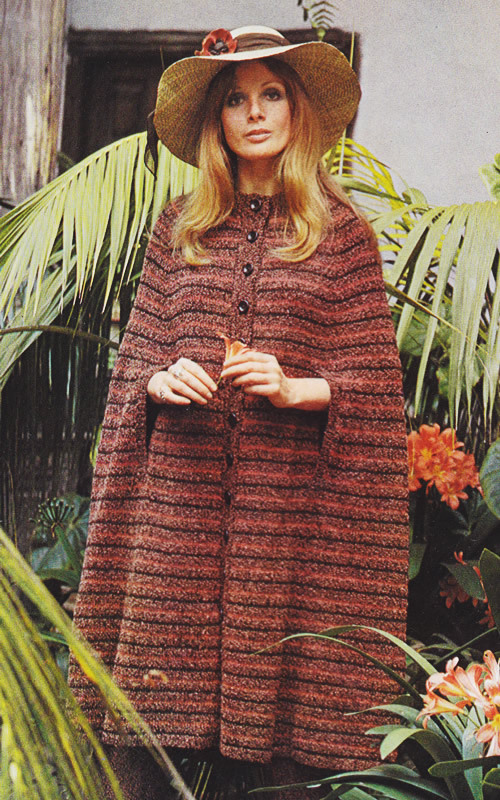 Of course you could easily knit the cape in a plain stitch instead of the pattern illustrated. Instructions for only one medium size - could be adapted by using a thicker yarn and bigger needles - but do work out your tension to check the size. 1st row (right side facing): in B k5, * with wool at back, slip 2 purlwise, k4; repeat from * to last 3 stitches, slip 2 purlwise, k1. 2nd row: in B k1, * wool forward, slip 2 purlwise, p4; repeat from * to last stitch, k1. 3rd row: in D k3, * wool forward, sl 2, k4; repeat from * to last 5 stitches, SL 2, k3. 4th row: in D k1, p2, * SL 2, p4; repeat from * to last 5 stitches, SL 2, p2, k1. 5th row: in B k1, * SL 2, k4; repeat from * to last stitch, k1. 6th row: in B k1, * p4, SL 2; repeat from * to last stitch, k1. 7th row: in D k5, *SL 2, k4; repeat from * to last 3 stitches, slip 2 purlwise, k1. 8th row: in D k1, * SL 2 purlwise, p4; repeat from * to last stitch, k1. 9th row: in B k3, * wool forward, SL 2, k4; repeat from * to last 5 stitches, SL 2, k3. 10th row: in B k1, p2, * SL 2, p4; repeat from * to last 5 stitches, SL 2, p2, k1. 11th row: in D k1, * SL 2, k4; repeat from * to last stitch, k1. 12th row: in D k1, * p4, SL 2; repeat from * to last stitch, k1. Repeat the 12 pattern rows 3 times more, then the first 6 rows again. Keeping pattern correct and keeping a knit stitch at each end of every purl row, as before, shape sides by decreasing 1 stitch at each end of the next and every following 10th row, until 46 stitches remain. Now decrease 1 stitch at each end of every following 6th row until 34 stitches remain, then at each end of every 4th row until 20 stitches remain. Make 5 more sections in same way. With No 10 (3½mm) needles cast on 70 stitches and work 5 rows in stocking stitch, starting with a knit row. [This last row forms a ridge]. Work a further 5 rows in stocking stitch, starting with a knit row. Place a marker at each end and in the centre of the last row. Change to No 8 (4mm) needles and continue in stocking stitch for a further 38 rows. With wrong side facing, shape sides by decreasing 1 stitch at each end of the next and every following 8th row until 40 stitches remain, then at each end of every 4th row until 18 stitches remain. Make 5 more sections in the same way. taking care the wool remains twisted during making up. Press parts very lightly on wrong side under a damp cloth. Using a fine back stitch seam (or mattress stitch), join 4 sections of the cape together at the side edges. Join sides together for 4 inches from lower edge. Leave the next 8 inches open for arm slits, then join remainder of side seam. Join remaining section to other side in the same way. Join the lining in the same way, measuring the 4 inches up to the arm slits from the purl ridge. Pin cape to lining, wrong sides together, lower edge of cape in line with markers on lining ; tack in position. Sew hem of lining neatly to edge of cape, then catch lining to cape round arm slits. Right Front Border: With No 10 (3¼mm) needles and D, cast on 13 stitches. 1st row: k6, SL 1, k6. Repeat these 2 rows until strip fits up right front edge when stretched, ending with right side facing. Note: For a good fit band needs to be 3 inches shorter than edge of cape. Next row: cast off 7, knit to end. Slip stitches on a safety pin. Left Front Border: Work as for right border, ending with wrong side facing. Sew one edge of border in position to cape, from lower edge to 9 inches below neck, without stretching. Now ease the last 9 inches of the front edge on to the remainder of the band. Fold the borders in half at the slipped stitch, and sew the other edge in position to the lining. Work 5 rows stocking stitch, starting with a purl row. Work a further 4 rows in stocking stitch, starting with a purl row. Fold the neck border in half at the ridge, and slip-hem in position to the lining. Sew on fastenings as in photo. Give cape a final light press. 22 x 1oz balls in DK yarn D (Ocean Deep ), and 9 balls in yarn B (Banff Brown). 10 (3¼mm), 8 (4mm) and 7 (4½mm) needles. The tension is given as 26sts and 42 rows to 4 inches over the pattern on No 7 needles. [Editor's note: the pattern stitch alters the tension making it much tighter than a plain stitch, so if you plan to knit the cape plain you will need to carefully check the tension and needles size. The pattern is given in only one size sizes to fit chest: 34-38 inches. Length from top of shoulders 27 inches. k2tog or p2tog: knit or purl 2 sts together (decrease one stitch). sl 1 (or sl 2): slip 1 (or 2) stitches by passing the stitch from one needle to the other without knitting it. The original yarn was Patons Fiona - a slightly fluffy Shetland double knitting yarn. 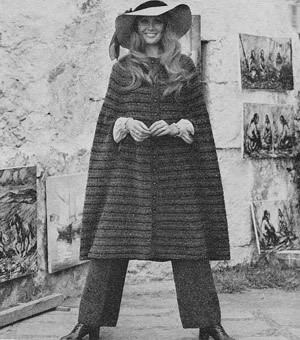 Capes being the thing of the moment (though maybe not quite like this one). Styled "Edwardian" from the early 1970s - hence the floppy hat and slightly whimsical setting a la Laura Ashley - I might choose to make this somewhat shorter, plain rather than striped, and use a tweed or textured yarn of some sort. So.... a midi cape - and if that were not wonderful enough... it comes with matching trousers! How great is that?! Instructions for larger sizes given in brackets. Where one set of figures is given this applies to all sizes. The cape is knitted in stripes of 3 different yarns - labelled Medium, Light and Dark - the Medium (or Main) colour is a bouclé and the Light (Red) and Dark (Brown) are smooth yarns. With No 10 needles and M, cast on 92 (98 : 104) stitches and work 4 rows k1/p1 rib. 1st and 2nd rows: in D.
3rd to 6th rows: in M.
7th and 8th rows: in L.
9th to 12th rows: in M.
Continue in pattern and work a further 12 rows straight. Next row: k2, k2tog, knit to last 4 sts, k2tog tbl, k2. Repeat the last 12 rows until 70 (76 : 82) stitches remain. Work a few rows straight until back measures 32 inches (81 cm) at centre, ending with right side facing. Continue decreasing 2 stitches as before, but on the next and every following 4th row until 38 (44 : 50) stitches remain. Work 3 rows straight, then decrease 2 stitches as before on the next and every alternate row until 28 (30 : 32) stitches remain. Work 1 row straight, and leave stitches on a spare needle or stitch holder. With No 10 needles and M, cast on 46 (48 : 52) stitches and work 4 rows k1/p1 rib. Join in D, change to No 8 needles and using stocking stitch, start with a knit row, and work 24 rows straight in striped pattern. Next row: k2, k2tog, knit to end. Repeat the last 12 rows until 34 (37 : 40) stitches remain. Work a few rows straight until front matches back to marker, ending with right side facing. Place a marker at each end of the last row. Now decrease 1 stitch as before, but on the next and every following 4th row until 20 (22 : 24) stitches remain. With wrong side facing, shape neck by casting off 4 (5 : 5) stitches at the beginning of the next row. Continue decreasing at the side edge on every 4th row from previous decrease, and at the same time decrease 1 stitch at the neck edge on the next and every alternate row until 9 (13 : 16) stitches remain. Now decrease 1 stitch at the side edge as before, but on the next and every alternate row, and at the same time continue decreasing at neck edge on the next and following 1 (3 : 5) alternate rows. [5 (5 : 4) stitches remain]. Work to correspond with left front, reversing shapings and working 'togtbl' when shaping side edge. With No 10 needles and M, cast on 80 (84 : 88) stitches and work 4 rows k1/p1 rib. Join in D, change to No 8 needles, and stocking stitch, and starting with a knit row, work 24 rows straight in striped pattern. Next row: k2, k2tog, knit to last 4 sts, k2togtbl, k2. Repeat the last 12 rows until 56 (60 : 64) stitches remain. Work a few rows straight until work matches back to markers, ending with right side facing. Place a marker at each end of the last row. Continue decreasing as before, but on the next and every following 4th row until 28 (32 : 36) stitches remain. Work 3 rows straight, then decrease 2 stitches as before on the next and every alternate row until 10 stitches remain all sizes. Leave stitches on a safety-pin. Make a second side in the same way. With No 10 needles and M, cast on 9 sts. 1st rows (right side facing): k2, (p1, k1) 3 times, k1. 2nd row: k1, (p1, k1) 4 times. Repeat the last 2 rows until the strip fits up the left front to the start of the neck shaping, when slightly stretched, ending with right side facing. Leave stitches on a safety-pin at the top and sew border in position. Work to correspond with the left border with the addition of 13 buttonholes. The first buttonhole is to come 4 inches (10 cm) up from the lower edge, and the 13th is 2 inches (5 cm) below the start of the neck shaping; the remainder are spaced evenly between. First mark position of buttons on left front with pins to ensure even spacing, then work holes to correspond. With right side facing, rib 4, cast off 2, rib to end. On the next row cast on 2 stitches over those cast off. Using a cool iron and dry cloth, press parts lightly on the wrong side, omitting the ribbing. Pin side panels to back; join panels up to markers matching stripes carefully, then join the remainder of the seam. In the same way, join the front panels to side panels, leaving 9 inch (23 cm) slits for hands, bottom of slit to come 18½ inches (47 cm) up from the lower edge. With No 10 needles and M, pick up and knit 45 stitches along the front edge of the slit and work 5 rows k1/p1 rib, with rows on the right side having a k1 at each end. Left slit border: work to correspond. Rib 9 from right border, pick up and knit 15 (16 : 17) stitches up right side of neck, k10 from side panel decreasing 1 stitch in centre, 28 (30 : 32) stitches from back decreasing 3 stitches evenly, 10 stitches from side panel decreasing 1 stitch in centre, then pick up and knit 15 (16 : 17) down left side, and finally rib 9 from left border. [91 (95 : 99) stitches. Work 5 rows in k1/p1 rib. Make a buttonhole in the next 2 rows as before, then work 12 rows. Make a buttonhole in the next 2 rows, then work 4 rows in rib. Fold neck border in half to the wrong side and slip-hem loosely in position all round. Oversew loosely round double buttonhole. Catch down short ends of slit borders neatly to main work. 13 (13 : 14) 50g balls in a bouclé DK yarn M (Terrazo), and 3 (3 : 4) 50g balls each DK yarn D (Loam Brown) and yarn L (Red Earth). 8 (4mm) and 10 (3¼mm) needles. The tension is given as 20sts and 30 rows to 4 inches overall using the striped pattern on No 8 needles. The pattern is given in three sizes to fit chest: 32-34 (34-38 : 40-42) inches or 81-86 (91-96 : 101-106) cm. Length from top of shoulders 41½ (42 : 42½) inches or 105 (106 : 108) cm. m1: pick up horizontal loop lying before next stitch and work into back of it. Patons Camelot (about which there is some misleading information on the web); it is a bouclé yarn knitted on 4mm needles with a stated tension of 19 sts to 4 inches - which makes it a somewhat heavy DK (or worsted/Aran) type weight. The pattern knits these yarns alternately in stripes and this overcomes their differences. In substituting I would look for any DK or worsted weight that I liked and experiment with needle sizes to get the stated tension. I can't offer any insights on yardage for these vintage yarns. Instructions for larger sizes given in brackets. Where one set of figures is given this applies to both sizes. The trousers are worked in one colour. With No 10 needles, cast on 86 (90 : 96 : 100 : 106 : 110) stitches, and work 4 rows k1/p1 rib. Change to No 8 needles and stocking stitch, starting with a knit row, and work straight until leg measures 25 (25 : 25½ : 25½ : 26 : 26) inches (63 (63 : 65 : 65 : 66 : 66) cm), ending with right side facing. Next row: (k1, m1, knit 45 (47 : 50 : 52 : 55 : 57), m1, k1) twice. Next row: (k1, m1, knit 47 (49 : 52 : 54 : 57 : 59), m1, k1) twice. Next row: (k1, m1, knit 49 (51 : 54 : 56 : 59 : 61), m1, k1) twice. Place a marker at each end of the last row. Cast off 2 stitches at the beginning of the next 2 rows, then decrease 1 stitch at each end of the next and every alternate row until 96 (100 : 106 : 110 : 116 : 120) stitches remain. Work 3 rows straight, then decrease 1 stitch at each end of the next and every following 4th row until 74 (78 : 88 : 92 : 102 : 106) stitches remain; then on every following 6th row until 66 (70 : 76 : 80 : 86 : 90) stitches remain. 2nd row and every alternate row: purl to end. 13th row: knit across all stitches picking up a loop at each point where work was turned and working it together with the next stitch to avoid a hole. Change to No. 10 needles and work 1 inch (2 cm) k1/p1 rib. Work as for left leg from ** to **. Then work from *** to end, reading 'p' for 'k' and 'k' for 'p'. Joint front, back and inside leg seams. Cut elastic to fit waist and join in a ring; sew to the inside of the waist ribbing using herringbone-stitch over the over the elastic to form a casing. Pair each Nos 8 (4mm) and 10 (3¼mm) needles. Length of elastic for waist of Trousers. [86 (91 : 96 : 101 : 106 : 111) cm]. [71 (71 : 72 : 72 : 73 : 73) cm].